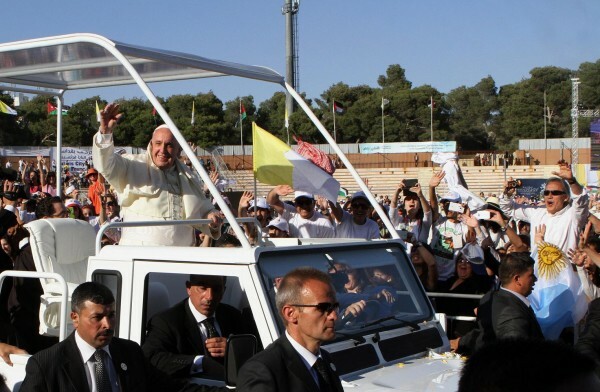 With a first-time entourage of a Jewish Rabbi and Muslim Imam from his home country of Argentina, Pope Francis arrived in Amman, Jordan Saturday on the first leg of his Middle East tour. At a Mass attended by nearly 30,000 people in an Amman stadium, Pope Francis spoke of how disturbed he was by all the tension in the Middle East and said that “fear of change” would only lead to more suffering in the region. The 77-year-old Pontiff called for a peaceful end to the Syrian Civil War, which has caused more than 130,000 fatalities, and lauded the Jordanian authorities for opening their borders and allowing Syrian refugees to flee the fighting. But this Middle East trip is considered historic by observers because it will see Pope Francis take many first initiatives. On Sunday, he will be the first Pontiff to cross from Jordan into the West Bank – occupied by Israel since 1967 – where he will meet Palestinian President Mahmoud Abbas. He will also mark the 50th anniversary of the reconciliation of the Catholic and Orthodox churches when he meets with the Patriarch of Constantinople Bartholomew I in Jerusalem. And in an unprecedented step, Pope Francis will lay a wreath at the grave of Theodore Herzl, the founder of Zionism who was rebuked by the Church nearly a century ago.